Light Fall's premise lends itself to running free across a shadowy world, but how well does Bishop Games live up to this potential? Our review. The land of Numbra is bereft of light. It's a land blanketed by nightfall. But nightfall threatens to turn into total darkness, as shadow hovers over the Kamloops tribe. Only an unnamed shadow can save the tribe and prevent the end of their world, but he'll have to use every ounce of agility in his body. 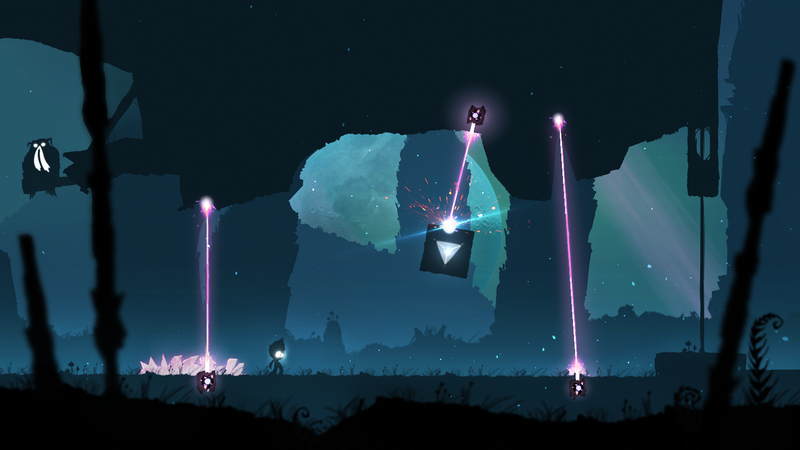 That's the idea behind Light Fall, a new 2D platformer from the folks at Bishop Games. Players are put into a seemingly vast world of challenging jumps and obstacles. But while Light Fall has a few cool ideas, it comes across as an all-too-brief experience with nothing to truly set it apart from its contemporaries. While the shadow can wall jump and leap across great distances, Light Fall's core mechanic allows players to go even farther. The Shadow Core is a box that players can create with the jump button, creating up to four blocks before hitting the ground. This opens the door to some wild speedrunning or for some more methodical navigation around obstacles. Using the Shadow Core has proven to be one of the more enjoyable aspects of the game, not so much because it grants me access to out-of-reach areas, but because it presents the challenge of completing certain sequences as quickly as possible. There are a few puzzle elements involving the Shadow Core that don't involve leaping wide gaps. Other buttons offer up different functions, like taking control of mechanical switches or holding a block in front of you like a shield. The Shadow Core's multiple applications would seem to lend itself to versatility, but the downside is that those multiple uses can't be wielded simultaneously. For example, you can't jump on a Shadow Core platform and use the Core Punch function to flip a switch without dissolving the first platform. As much as I like the Shadow Core features, it would be really nice to be able to wield more than one ability at the same time. As it is, the Shadow Core platforms will get the most use, just because of the sense of velocity that it creates. It's entirely possible to get through entire stretches by making huge leaps and landing on makeshift platforms to get even greater distance. It's even more satisfying to use when cleverly placing those platforms away from killer obstacles. That's why it can be a bit of a bog when hitting sequences intended to slow the player down, such as boat sequences or vertical jumping areas. Beyond the platforming, Light Fall feels at its best during the game's few boss battles. Because of the shadowy protagonist's limited size, the world already feels massive by comparison. Bishop Games does a great job of creating giant boss battles that require platforming ingenuity and a mastery of more than one Shadow Core skill. But while Light Fall has a few occasional difficulty spikes, it should be noted that the last boss fight is brutally tough. This is where Light Fall goes from a platformer with occasional puzzle elements to introducing a lot more bullet hell. Beyond having numerous attack patterns, some of which there are no obvious counters for, it's made unclear how to make any progress. It can feel like an overwhelming difficulty spike and not a particularly fair one. Light Fall shows potential with its central premise and its core mechanic, but short levels, a run-of-the-mill story, and an all-too-brief campaign make it feel like there's some unrealized potential here. There are hidden items worth finding, but exploration isn't this game's strong suit, mostly because the environments all feel like a different shade of stylistic shadows. As it is, Light Fall is a decent adventure to experience once, but its brightness burns out awfully fast. This review is based on a Nintendo Switch digital code provided by the developer. Light Fall is available now on Steam and the Nintendo eShop for $14.99. The game is rated E10+.